The much-awaited single from Mani Ratnam’s Kaatru Veliyidai is out! There’s no need for any introduction for Mozart of Madras, A.R.Rahman’s magical collaboration with the legendary director. Azhagiye, starts off with interesting sounds and keeps you energetic till the very end. Arjun Chandy’s voice looks very fresh with ample vocal support by Haricharan and Jonita Gandhi in the charanams. Karky’s blend of English and Tamil words goes well with the pumping music. The ‘Azhagiye’ portion is the highlight of the song, which easily makes you hum the lyrics and get along with the song. An interesting dance number from the magical combo is what we have got as a single. 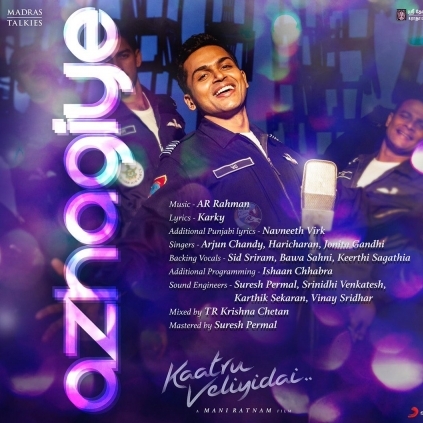 'Azhagiye' is very well with the trend, but; there might be a section of people who would miss the magical feel that the Vaan Varuvan (Glimpse song from Kaatru Veliyidai), Mental Manadhil (OK Kanmani) song or the 'Nenjukkule' (Kadal) song gave. Thala 57 first look exclusive insights and poster description! Atlee's dream comes true today in the sets of Vijay 61! Just In: Another interesting addition to Vijay 61 team! Red Hot: AK57 title is here!!! Dropped Selvaraghavan - S.J.Suryah's film! Will Mani Ratnam Head To Europe For The Shoot Of Kaatru Veliyidai? People looking for online information on A.R.Rahman, Kaatru Veliyidai, Mani Ratnam will find this news story useful.